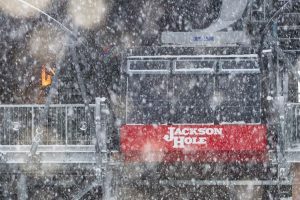 Teton Village, WY – The power is out in Teton Village, and officials at Jackson Hole Mountain Resort indicate that it may be up to a week before it’s restored. As a result, the ski area is closed “until further notice,” today’s snow report indicates. Wind gusts exceeding 90 m.p.h. were reported in the area overnight. 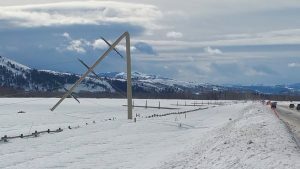 Power supplier Lower Valley Energy reports that 17 steel high voltage transmission poles buckled on the Moose-Wilson Road, a.k.a. Highway 390, shutting down power to an estimated 3,500 to 4,000 customers in Teton County. Affected areas include not only Teton Village, but also the airport, Solitude, John Dodge and Bar B Bar. “Most of the power lines you see in our service territory are smaller distribution lines – when distribution lines go down we can more easily re-route power to energize the affected areas,” explains Lower Valley Energy spokesperson Brian Tanabe. “Transmission lines feed large amounts of power to our substations, which are then distributed out to our customers. When the transmission system fails for whatever reason, the line needs to be entirely repaired (versus re-routing power). “The cause for the downed transmission lines is not yet known, though the area is experiencing higher than normal wind gusts,” Tanabe added. 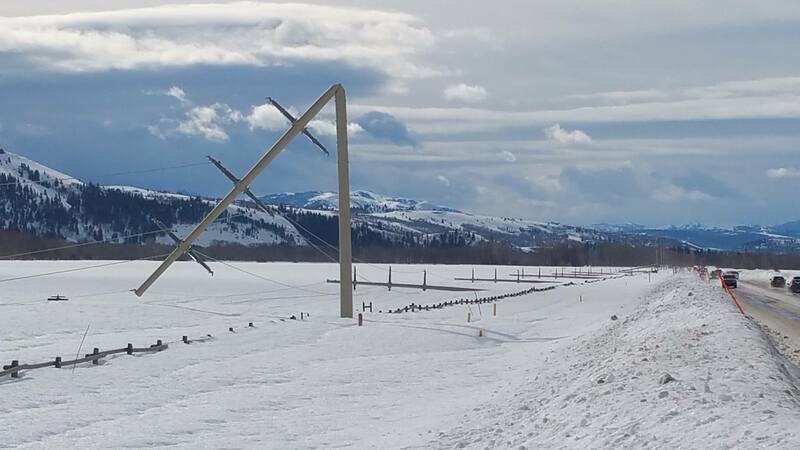 The utility’s current game plan calls for first clearing snow to gain access to each damaged transmission pole, replacing them with temporary wooden structures that will hopefully allow crews to first restore power to the airport, at least on an intermittent basis. In the interim the airport is running on backup generator power. For the moment at least, skiing at nearby Grand Targhee Resort isn’t an option for Jackson Hole visitors as Teton Pass remains closed by the Wyoming Department of Transportation (WYDOT). 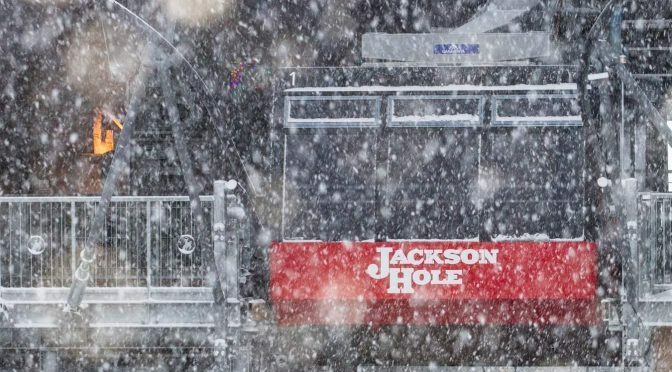 The Jackson Hole Chamber of Commerce emphasized on Wednesday that the lights are still on in the town of Jackson, and skiing is still available at Snow King Resort. Nevertheless, United Airlines, Delta and American Airlines have all begun issuing travel waivers for affected customers flying into Jackson Hole. Social media on Wednesday was buzzing with posts written by travelers holding reservations in Jackson, but re-routing to other ski destinations. The Jackson Hole Chamber of Commerce and Jackson Hole Central Reservations are assisting with lodging and travel options for displaced guests. In an afternoon update, Jackson Hole Mountain Resort’s Facebook page indicates that based on the power company’s assessment of the damage, “the earliest targeted open date at this time is Monday, February 13th.” All Lower Valley Energy crews have been dispatched to the scene, along with crews from five neighboring utilities, including those in Idaho Falls and Salt Lake City, heading to the area to assist along with ski resort employees. With all of that help, “We are hoping we can complete this task earlier than the estimate of five to seven days,” said Tanabe. 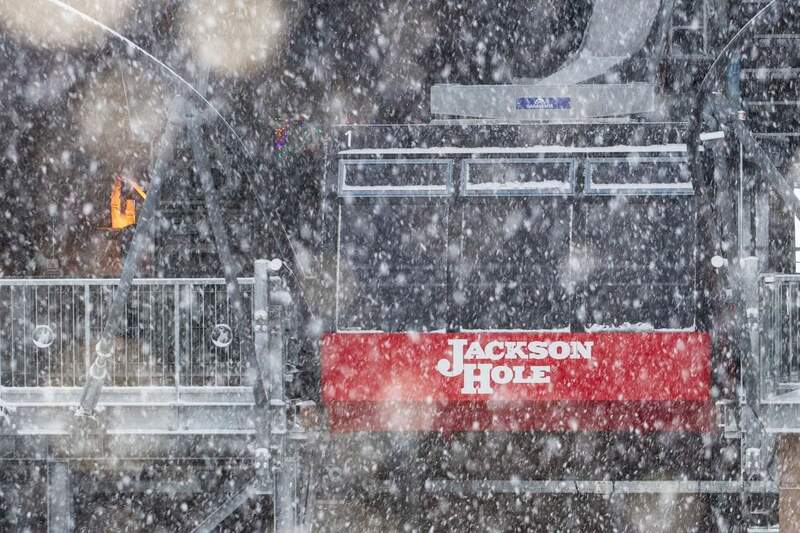 All events scheduled for this week and weekend at Jackson Hole Mountain Resort will be canceled, specifically Skijoring and Special Olympics. WYDOT has closed Highway 390 beyond Teton Village at the request of law enforcement, although travel to Teton Village is still permitted. Violators face fines of up to $750 and/or up to 30 days imprisonment. Resort officials are strictly enforcing a prohibition on uphill travel, and will be issuing refunds for all visitors once they find a location to process those refunds. Teton Village Fire Department will be providing emergency services throughout this incident, and will be updating hotels and businesses as information comes in.